Cholera In Haiti: Preparing, Crossing Fingers : Shots - Health News As the toll of cholera in Haiti mounts, public health officials are pushing to contain the outbreak. The disease can be deadly. But fairly simple precautions can slow the spread of the disease. The cholera outbreak in Haiti that has so far (officially) sickened 3,015 people and killed 253 should be containable, health officials say. But that's only if desperate efforts succeed in getting clean water, treatment and isolation facilities, and wash-your-hands messages to the beleaguered population. In fact, the chief of staff at Haiti's Ministry of Health is not so optimistic. "I have no doubt that it will arrive in Port-au-Prince, because people are moving a lot," says Dr. Ariel Henry. "It will arrive during the next week, probably." Five or six cholera victims have been identified in the capital so far. They were infected in the epidemic's epicenter – the Artibonite Valley in Haiti's central uplands, or around Saint-Marc, a coastal city northwest of Port-au-Prince. But the presence of cholera patients in Port-au-Prince doesn't mean the epidemic has arrived there. Spread is rarely person-to-person. 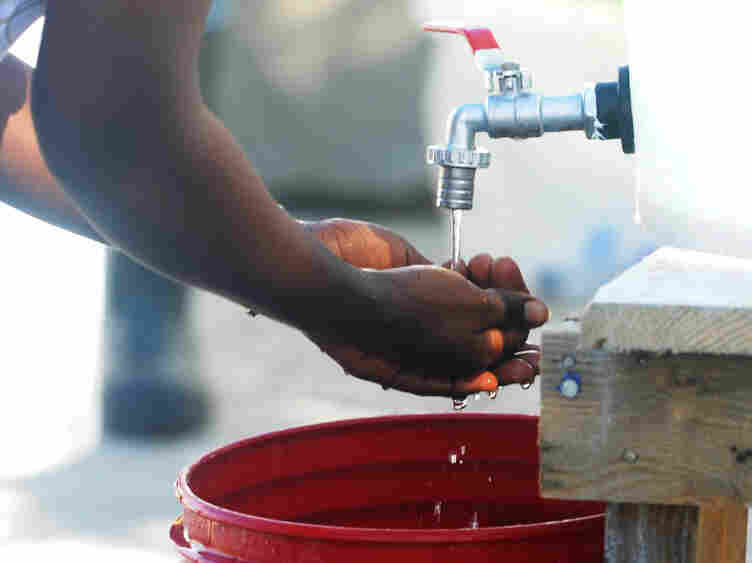 It takes contamination of water supplies and a concentration of people without access to adequate sanitation facilities – precisely the situation, of course, throughout Haiti, but especially in post-earthquake Port-au-Prince. "You have to have quite a few people to contaminate a body of water," says Jason Erb of International Medical Corps, a medical aid group. The situation "is not good," Erb says, "but it's not going to lead to a massive outbreak." Nevertheless, the WHO and Pan American Health Organization are preparing for a worst-case scenario -- that is, a national cholera outbreak. Even if that happens, massive cholera fatalities are not a given. True, the Vibrio cholerae bacterium can kill within hours due to overwhelming diarrhea that depletes the body of fluids and electrolytes necessary to keep heart beating, kidneys functioning and nervous system firing. Even among the severely ill, fatalities can be kept very low – on the order of 1 percent. "Cholera is an easily treatable disease," the WHO says. But the big asterisk on that fact is that a quick-and-simple treatment called oral rehydration -- using clean water and a packet of electrolyte salts -- has to be available quickly. Antibiotics are a backstop. So everything depends on the public health mobilization taking place right now – setting up treatment centers, deploying rehydration kits and clean water, educating the populace on the importance of washing their hands (if they can get access to clean or chlorine-treated water). The tattered camps that more-or-less shelter 1.3 million earthquake-displaced Haitians are, of course, an open opportunity for the spread of cholera. But some worry that the slums of Port-au-Prince pose a bigger problem than the camps. They don't even have the inadequate latrines that many camps do.